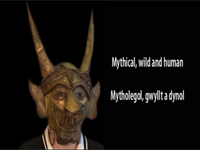 Oriel y Parc Gallery & Visitor’s Centre in St David’s was the location for a programme of school and community workshops inspired by the 150 carved stone corbels of mythical beasts, wild animals and human heads that adorn the Bishop’s Palace in St David’s. The fantastically creative duo, Pip and Guy, from spacetocreate.org.uk inspired these young people to craft the spectacular masks you see here. The Curious Ostrich presents this little film to showcase the wonderful work of all who took part. Organised by the Arts Council of Wales and Cadw as part of their Cauldrons & Furnaces project and funded by the Legacy Trust, the project is part of the Cultural Olympiad programme.